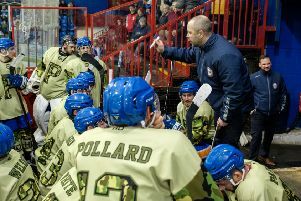 Proud player-coach Slava Koulikov insists he will never forget the day he led Peterborough Phantoms to trophy glory. Koulikov’s first full season in the city hot-seat came complete with English Premier League play-offs success following a 5-2 victory over Manchester Pheonix in the Grand Final yesterday (April 5). This moment will stay in my life forever. I will not forget my first trophy as a coach. And he was quick to admit his players have massively exceeded his own expectations for a season in which a top-six finishing position was the club’s sole target. They had no problem in surpassing that to finish fourth in the regular-season standings before swooping for a first trophy in six years when ruling supreme at the Coventry Skydome over the Easter weekend. A semi-final win over double-winners Telford on Saturday (April 4) preceded their final triumph yesterday. Koulikov said: “I’m a little bit shocked but very ecstatic. “We beat the top team in the league, Telford, on Saturday and gave everything we had. “I was a little concerned over whether we would be able to perform again in the final, but we did it. “My guys are fantastic. They have done everything right to win this trophy. “We don’t have the most talent in the league, but winning things is about having a group of guys who perform for the club and each other collectively. “This moment will stay in my life forever. I will not forget my first trophy as a coach. “I won the play-offs as a player and I told all the guys about what an unbelievable feeling it is. Now they have experienced it for themselves and they know what I meant. “We have the best goalie in the league, the best team and the best coaching staff. We also have a group of guys who have believed in everything that has been asked of them. “We have worked hard for many months. I’m sure the guys hate me a lot of the time, but now they will be loving me! “If anyone had said to me in August that we would win the play-offs, I would not have listened to them. “The aim for this season was simply to finish in the top six with a new-look team, but the longer it went on, the more I believed we could win something and yesterday it happened. Koulikov is close to finalising a new contract to remain as Phantoms chief with his current 18-month deal now expiring.